It is always nice to have all the comforts of a professional spa inside your home, but, in the past, this simply could not be possible. The Kendal MS0810M offers all the treatments you need for your tired legs and even more. First of all, this unit offers a great heating therapy that is easily employed by hot water. The machine works with oxygen bubbles, too, that gently caress and massage your legs, so you can feel more relaxed and relieved of pains and tension. The high frequency vibration feature ensures that the muscles in your legs get the thorough massage they need. Infrared therapy is an added bonus. The model is built for safety and this is one of the many reasons why so many people consider it the best home foot spa. The heating semiconductor is built by DuPont, a reputable manufacturer with a longstanding tradition in making this kind of components for various devices. The semiconductor is constructed so that it prevents overheating. Its other important role is to help the water heat up fast and be maintained at a constant temperature, so you can enjoy the best foot massage ever. The multi-insulation protection is employed on the unit for the same reason. The Kendal MS0810M is built for comfort and convenience. The size of the container is large enough to fit a man with size 14 in footwear, to give you a clear idea of how large it is. The body of the unit is made of a special type of plastic that does not suffer deformations even when exposed to high temperatures for a long time, as is the case with hot water foot baths. The overall construction is elegant and you will love having it in your home. In case you want to offer it to someone else, this makes for the perfect gift. The model reviewed here is more than just a simple foot bath in which you throw some hot water and some salts. 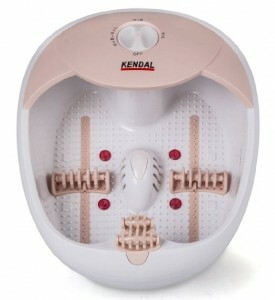 Although a regular, simple foot bath that uses just water and salts is beneficial, too, the Kendal MS0810M is nice to have because it offers increased benefits over this type of home based foot treatment. The many therapies used by the unit are a good way of ensuring a boost for your metabolism and for your overall health. The feet are very important for the body, and stimulating and massaging them properly have a tremendous impact on the entire body. Your blood circulation will greatly improved, which means a lowering in the occurrence of cardiovascular diseases. Your metabolism benefits from a relaxed body, and so does your mind. It has been showed multiple times how proper relaxation works wonders for a tired psyche, just as it does for a tired body. While the model is built to accommodate men’s feet, too, those with really large feet complain that the unit is not as comfortable for them as for others. A solution to this issue was found by the same users who say that they simply use less water so they can enjoy the pleasant therapies offered by the product.